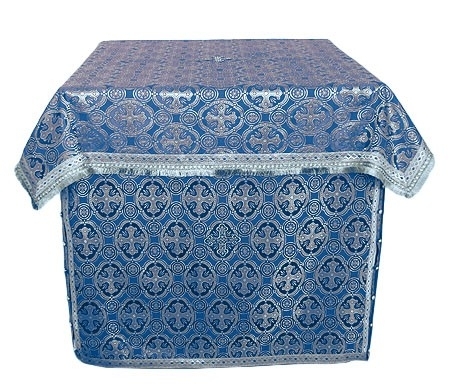 Orthodox Church liturgical Oblation table vestments (blue-silver) by Istok Church Supplies Corp.
Istok Church Supplies are experts are making different kinds of altar cloths, including Oblation Table vestments. So, if you’re in need of a made-to-measure blue-silver Oblation Table vestment, your search stops here! Here at Istok Church Supplies, we understand that the color of the Oblation Table vestment changes according to the liturgical season and must match with the Holy Table vestments. Keeping this in mind, we offer Oblation Table vestments in various liturgical color combinations, include blue-silver. Our blue-silver Oblation Table vestments are offered in two broad fabric options – silk and brocade. Prices vary according to the intricacy of design and customers can select the best vestment that suits their requirements and fits their budget. The Oblation Table has great significance during the Divine Liturgy – it is the place where Holy bread and wine are consecrated. With all eyes focused on the act, the Holy Altar must appear resplendent. To enhance the opulence of Oblation Table vestments, we provide standard decoration at no extra cost. For high-end results, customers can select premium decoration and/or velvet inserts for an additional price. Each one of our Oblation Table vestments are created to last and endure for many years. In addition to this, we’re offering made-to-measure services. Simply let us know the exact measurements of your Oblation Table (you can do this in the Notes field while placing your order) and our skilled tailors in Europe will execute your order with high quality workmanship and attention to detail. For made-to-measure items, we require a few weeks to compete an order. We strongly suggest you place your order as early as possible if you need the vestment for a special occasion. We deliver to major cities around the world. Come join our growing family of satisfied customers – order a bespoke Oblation Table vestment from us!